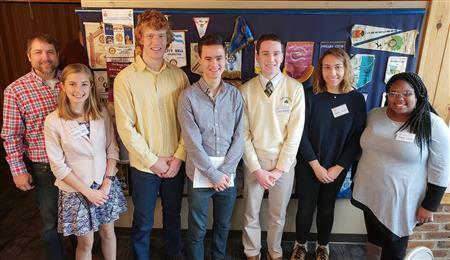 Mechanicsburg Rotary students for the month of April were introduced on April 3rd and were interviewed by Patrick Wolfkill. 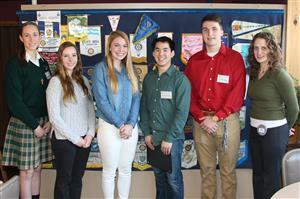 Mechanicsburg Rotary students for the month of March were introduced on March 6th and were interviewed by Amy Bockis. 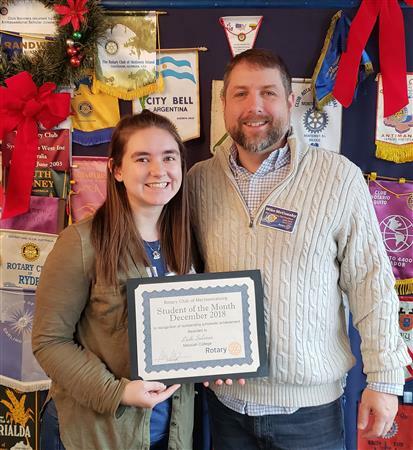 Mechanicsburg Rotary student for the month of December was introduced on December 5th and was interviewed by Patrick Wolfkill. 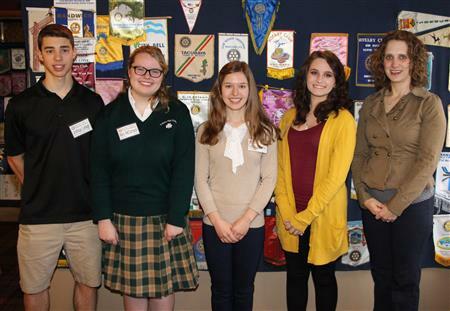 Mechanicsburg Rotary students for the month of November were introduced on November 7th and were interviewed by Past President Amy Bockis. 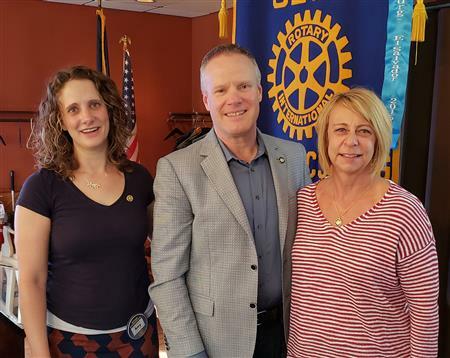 Amanda Lawson, The Major Gifts Office, Zone 23 of The Rotary Foundation (TRF) spoke to the club on November 7th. 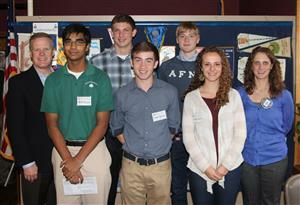 Mechanicsburg Rotary students for the month of October were introduced on October 3rd. They will be interviewed on October 17th. 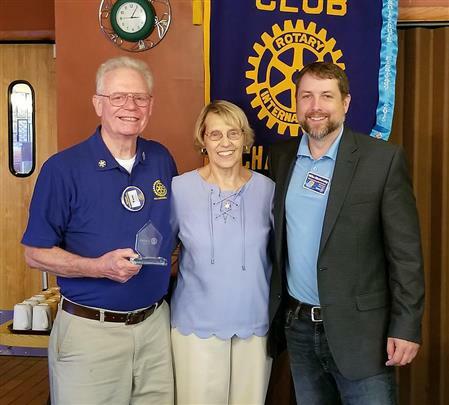 Member Darrell Westby honors his wife, Lorraine Westby, with the Paul Harris Fellow award at the club meeting of September 26th. Member Joe Wright receives the Paul Harris Fellow award at the club meeting of August 29th. 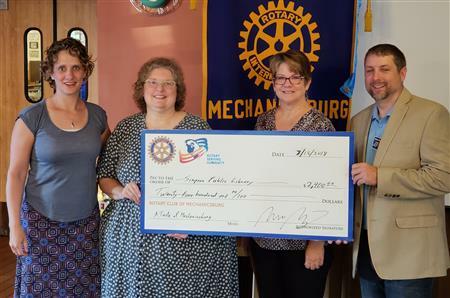 At the meeting of August 15, the Rotary Club of Mechanicsburg presented a share of the proceeds from the A Taste of Mechanicsburg to the Simpson Public Library. At the meeting of August 15, several presentations were made to members. 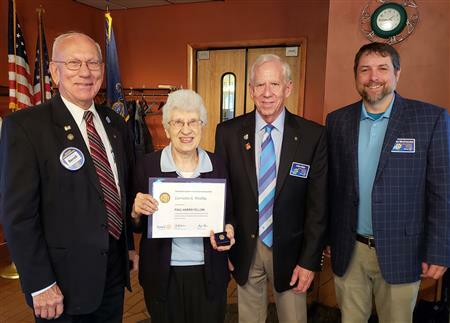 Dave Brant and Phil Fogarty received additional Paul Harris Fellows pins and recent new member, Fitz Fitzpatrick, received his membership certificate. 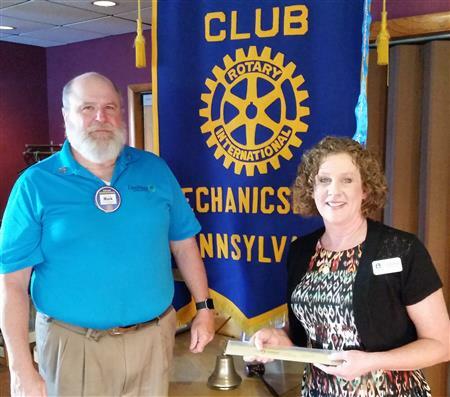 On July 25, 2018 at the Rotary Club of Mechanicsburg's regular weekly meeting, Tom & Kathy Burson were recognized as the club's newest members of the Rotary Bequest Society. 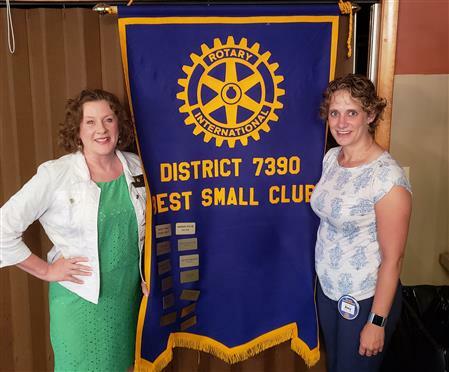 At the meeting of July 25th, Past District Governor Una Martone presented to the Rotary Club of Mechanicsburg the Best Small Club banner and plaque for the 2017-18 year. 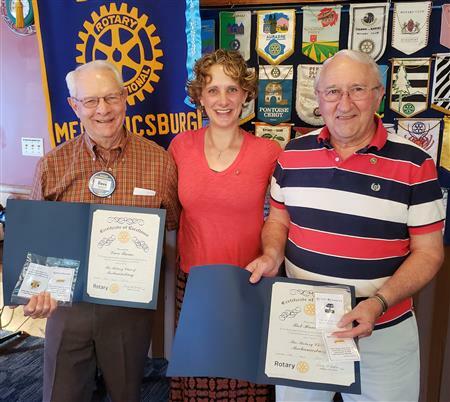 At the meeting of July 18th, Past President Amy Bockis honored Dave Burns and Bob Hamilton with awards since they were not able to attend the induction meeting of June 27th. Seth Arbogast was inducted as the club's newest member on June 13th. 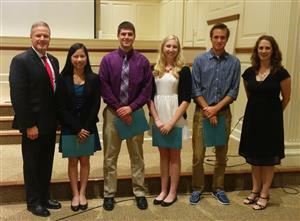 The Rotary Club of Mechanicsburg presented four $2,000 scholarships at the Scholarship Award Dinner on May 30th. The keynote speaker was District 7390 Governor Elect, John May. 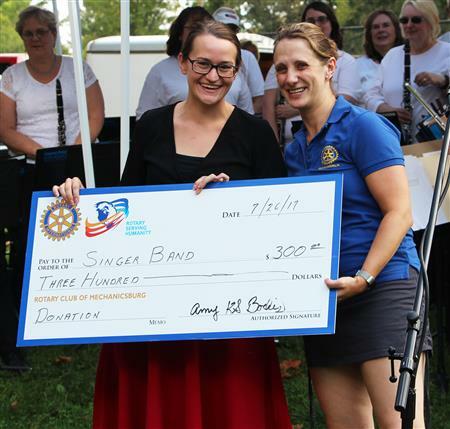 The Rotary Club of Mechanicsburg makes a $300 donation to the Singer Band. 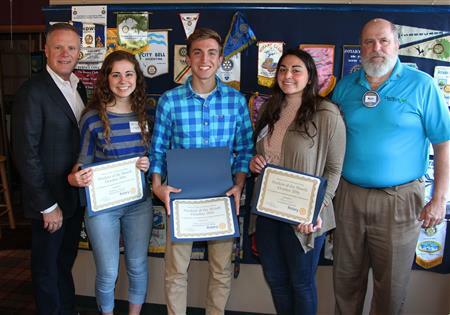 The Rotary Club of Mechanicsburg presented two $2,000 scholarships at its regular meeting on May 23rd. 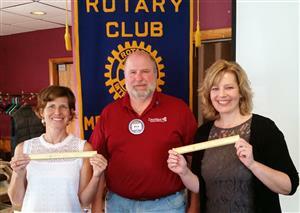 John and Carol Petrie were recognized at the May 23rd club meeting for joining the Rotary Foundation Bequest Society. 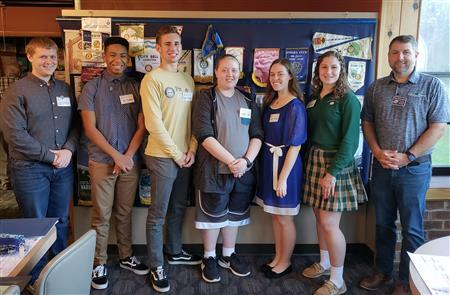 Mechanicsburg Rotary students for the month of April were welcomed on April 4th and were interviewed by Patrick Wolfkill. Past President Barry Wagner unexpectedly passed away Wednesday, March 28, 2018 at Harrisburg Hospital. 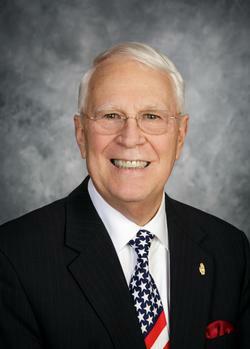 He was the club's current Rotary Foundation Chair. 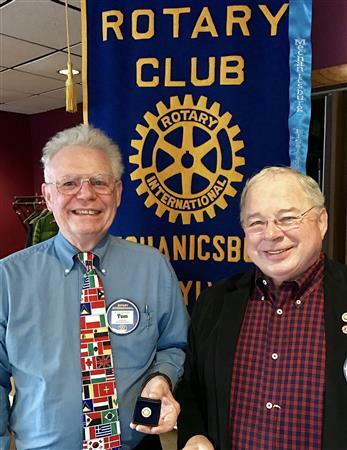 Barry joined the Mechanicsburg Club and Rotary on February 6, 2002. He quickly moved up the chairs to become president for the 2005-06 club year. 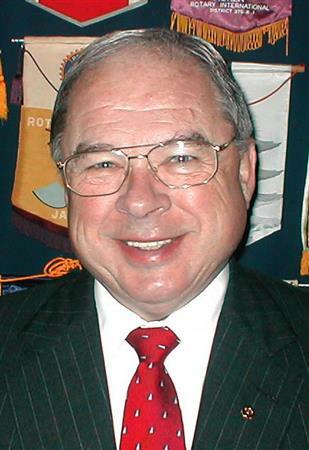 Beginning in 2010 he became the Club's Rotary Foundation Chair where he served with dedication until his passing. He was often the first one to the meeting, helping setup even when it was not his assignment. He was always upbeat, a great supporter of Rotary and its mission, and had a good story to tell. We thank him and will miss him greatly. Our heartfelt sympathy goes out to Barry's wife Joanne and family. 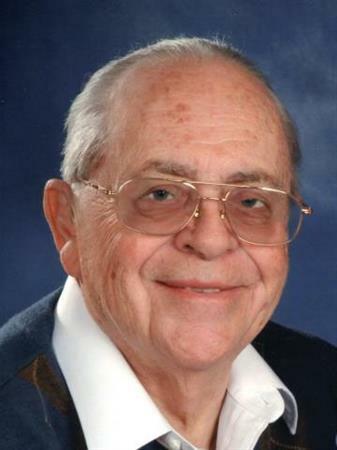 There will be a visitation from 5:00 until 7:00 p.m. Thursday, April 5, at Malpezzi Funeral Home, Mechanicsburg. His complete obituary is at this link. 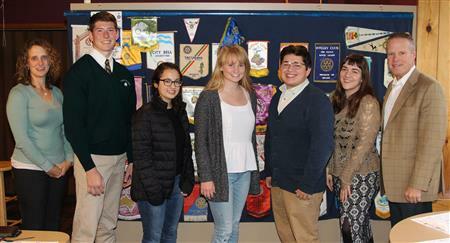 Mechanicsburg Rotary students for the month of March were welcomed on March 7th and were interviewed by Patrick Wolfkill. 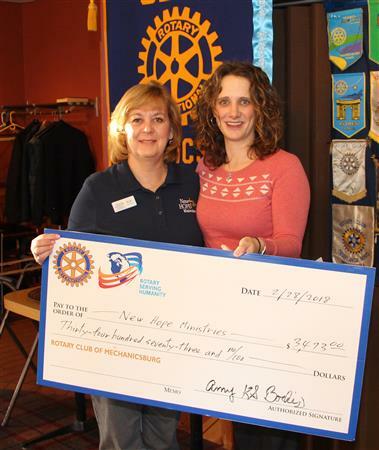 The Rotary Club of Mechanicsburg makes a $3,473 donation to New Hope Ministries. 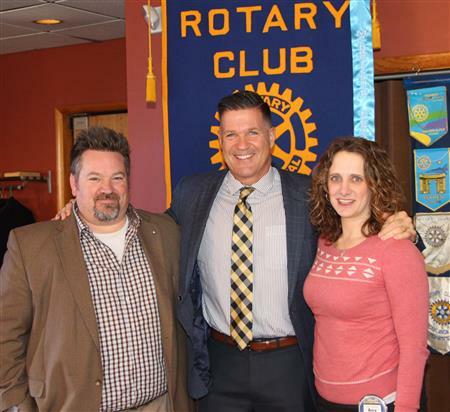 On February 28, State Senator Mike Regan gave a legislative update to the Club. 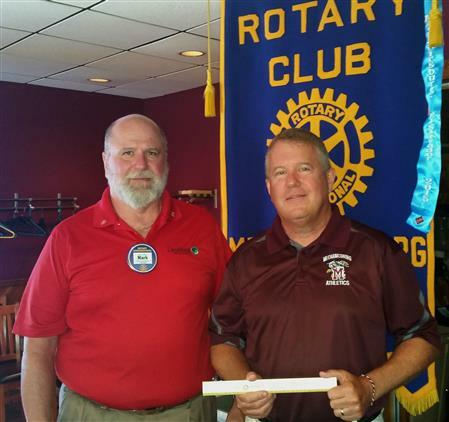 Tim Yaeger receives $3,700 donation from Mechanicsburg Rotary Club to be used to finish the complete fence replacement at the York Street Majors field. 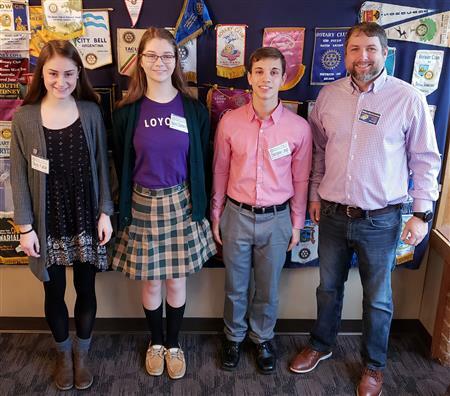 Mechanicsburg Rotary students for the month of February were welcomed on February 14th and were interviewed by Patrick Wolfkill. John (Fitz) Fitzpatrick was inducted as the club's newest member on January 24th. 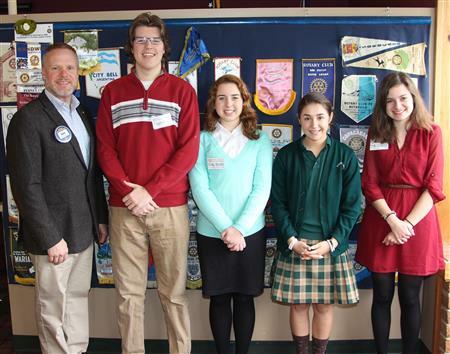 Mechanicsburg Rotary students for the month of January were welcomed on January 3rd and were interviewed by Patrick Wolfkill. 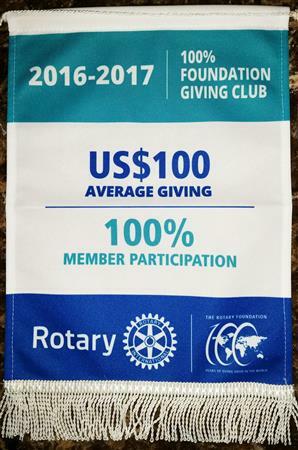 The Rotary Club of Mechanicsburg was recognized at the District 7390 Rotary Foundation Dinner on November 15th where it received the 100% Foundation Giving Club banner and a Certification of Appreciation for its support of the End Polio Now campaign. 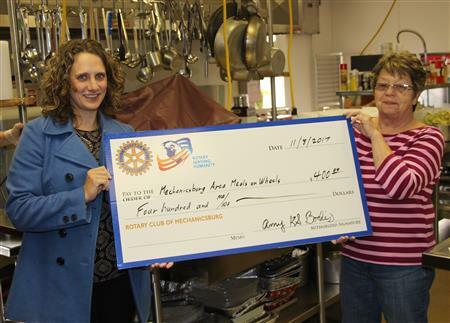 The Mechanicsburg Rotary Club as part of its ongoing support, presented a new Hobart Automatic Meat Slicer to the Mechanicsburg Area Meals on Wheels (MAMOW) at its kitchen on November 8th. 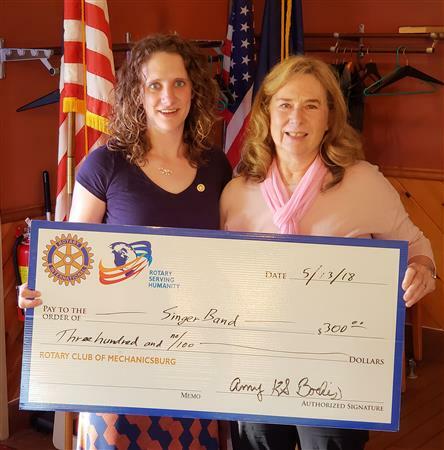 Funding for the $5,400 slicer was provided by the club's project fund plus a $2,500 grant it had applied for from the Rotary Foundation via its local Rotary District 7390. 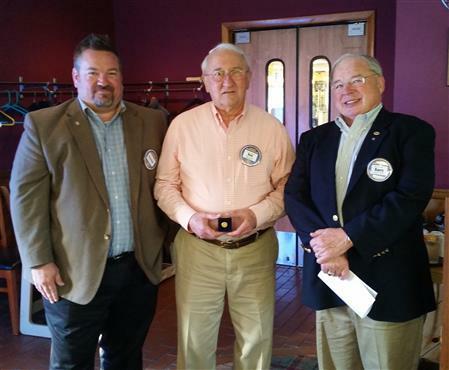 Past President Mark Dixon was recognized for his service at the Nov. 8th meeting. 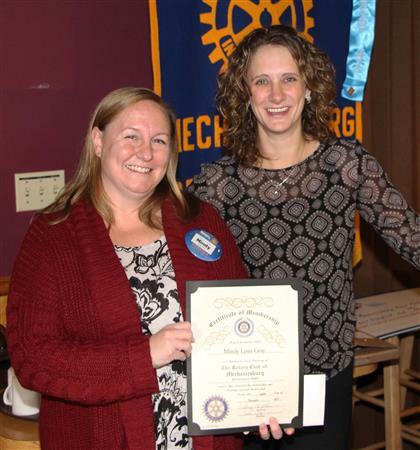 Mindy Gray was inducted as the club's newest member on November 8th. 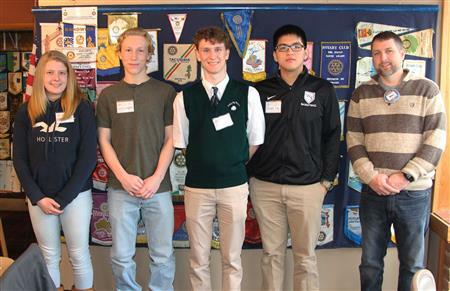 Mechanicsburg Rotary students for the month of November were welcomed on November 1st and were interviewed by John Petrie. 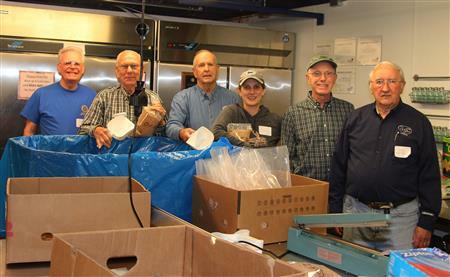 Several members of the Rotary Club of Mechanicsburg help out at New Hope Ministries on October 31st in the day of service for October. 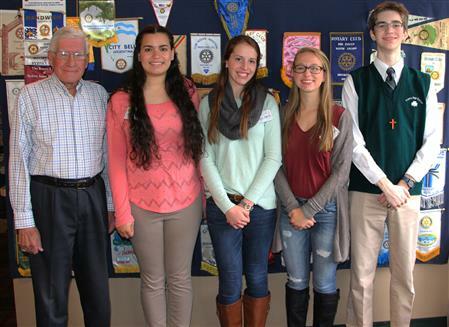 Mechanicsburg Rotary students for the month of October were welcomed on October 4th and were interviewed by Patrick Wolfkill. 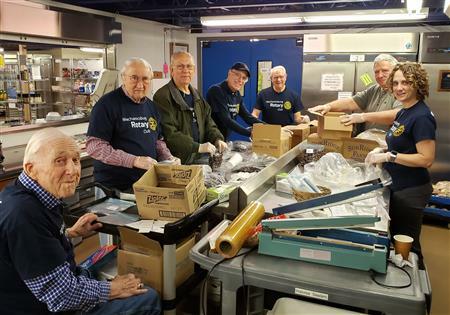 The Rotary Club of Mechanicsburg shifted its meeting time on Wednesday, August 23rd, to 6:00 PM to perform a service project for the community and the club. 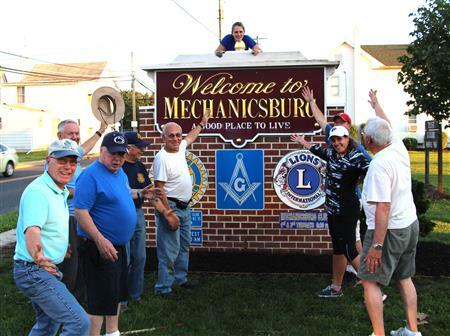 It cleaned up the landscaping around the Welcome to Mechanicsburg sign and a granite marker. 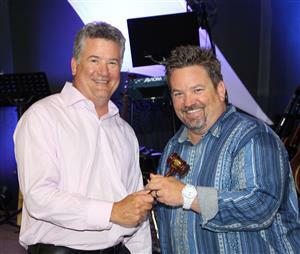 Past President Mark Dixon was honored for his service at the July 5th meeting. 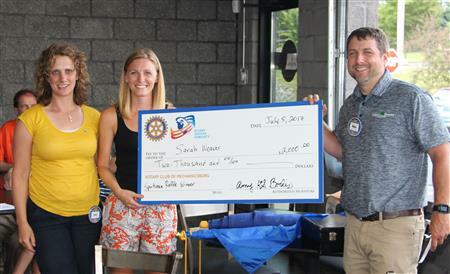 The Mechanicsburg Rotary 2017 Sportsmen Raffle concluded on June 30th with the the final $2,000 cash prize being won by Sarah Weaver. 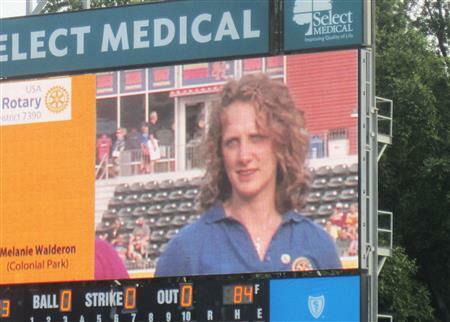 The Rotary Club of Mechanicsburg's President for 2017-18, Amy KS Bockis, was inducted along with other club presidents from District 7390 during the opening Ceremonies of the harrisburg Senators baseball game on June 29th. Honorary and former active club member, Bob Suckling, passed away on Tuesday, June 13th. He joined the Mechanicsburg club in December 2004 after retiring to Bethany Village from Altoona where he had been a club member since 1973. 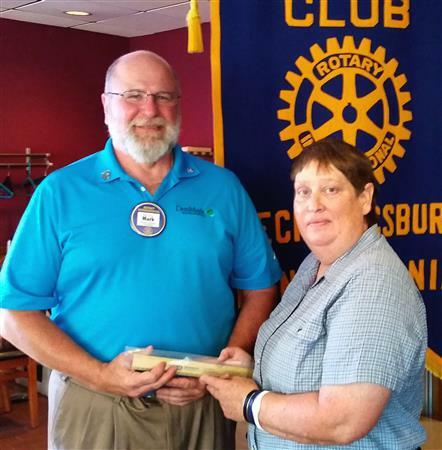 He was made an honorary Mechanicsburg club member in June 2015. His funeral was held on June 19 in Duncansville, PA with a memorial service at Bethany Village on June 22. His complete obituary can be found here. 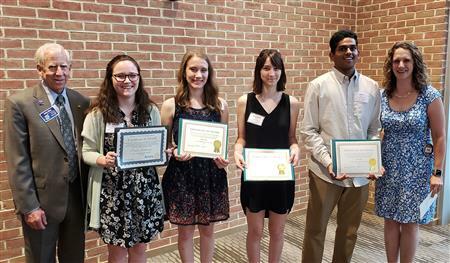 The Rotary Club of Mechanicsburg presented five $2,000 scholarships at a special dinner meeting held at Messiah College on June 7. The keynote speaker was District 7390 Governor Elect Una Martone. 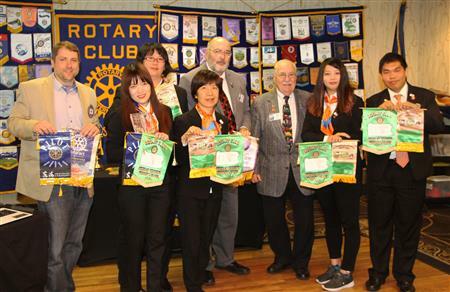 The Rotary Group Vocational Service Exchange Team (GVSE) from Taiwan Rotary District 3460 visited with our District 7390 Groups A & B the week of April 29 thru May 5 after their arrival in Lancaster on April 22nd. The thumbnail image (click to enlarge) is the club banner exchange at the three club meeting on May 4th. Left to right: Mechanicsburg Vice President, Mike McConahy; Hsin-Yi Lee (Tiana); Hsin-Chich Lin (Taishow); GVSE Team Leader, Anna Lee; Mechanicsburg North Club President, Chuck Hiller; West Shore Club President, Chuck Cenkner; Lin-Ya Huang (ViVi); and Ming-Jhang Lai (Bug). Former club member, Don Gleichman, passed away on Friday, May 5th. He was the Club President in 2006-07. He was a great promoter of the club participating in an international project and went on our first well drilling project with his granddaughter, Eliana, in El Salvador in 2009. He resigned in 2012. His obituary is at this link. 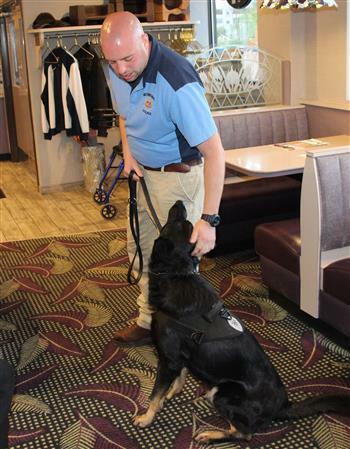 At a special evening meeting of the club on April 26, club members and guests learned about the new officer, K-9 Marc, he joined the Mechanicsburg Police Department to work on drug detection and as a tracker. 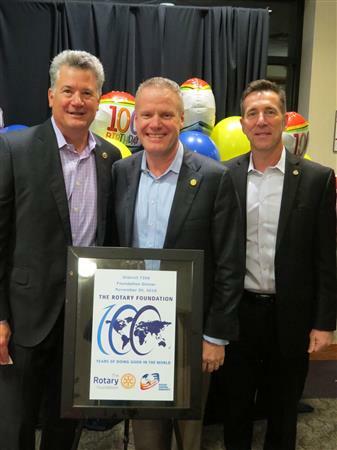 The Rotary Club of Mechanicsburg under the leadership of Dave Burns has concluded a fund raising project for Polio Plus in recognition of the 100th anniversary of the founding of The Rotary Foundation in 1917 at the International Convention in Atlanta. At the end of March, a total of $1,945 was raised for Polio Plus. 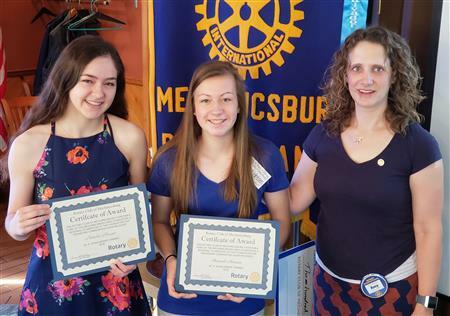 Mechanicsburg Rotary students for the month of April were welcomed on April 5th and were interviewed by Amy Bockis, Student of the Month Committee member. 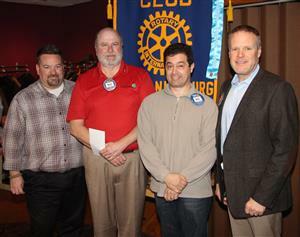 At its meeting of March 29th, The Rotary Club of Mechanicsburg made a number of donations to local organizations. Representatives of each organization were present to receive the donations. 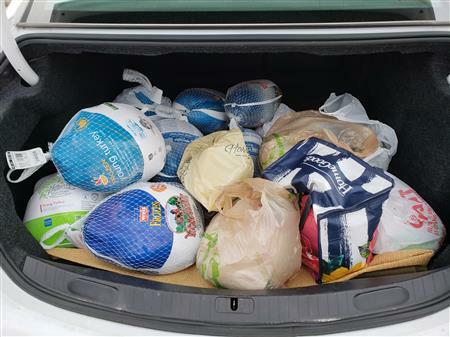 These donations are possible because of funds raised by various club projects as well as other donations toward the club's charitable and educational funds. 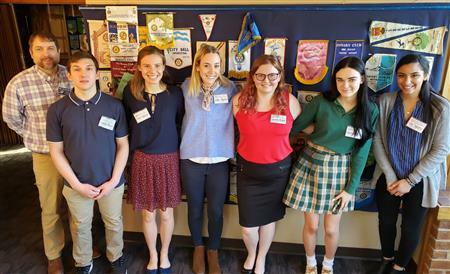 Mechanicsburg Rotary students for the month of March were welcomed on March 1st and were interviewed by Amy Bockis, Student of the Month Committee member. 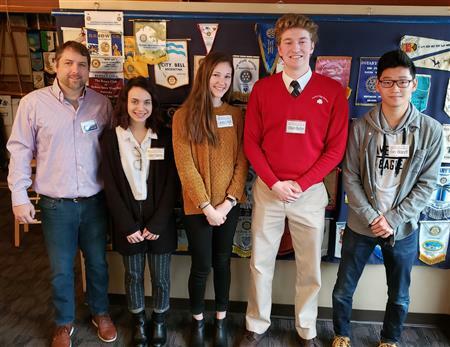 Mechanicsburg Rotary students for the month of February were welcomed on Feb. 1st and 8th and were interviewed by Amy Bockis, Student of the Month Committee member. Tom Burson receives an additional Paul Harris Fellowship Award at the February 1st meeting. Students for the month of January were welcomed on Jan. 4th and were interviewed by Amy Bockis, Student of the Month Committee member. 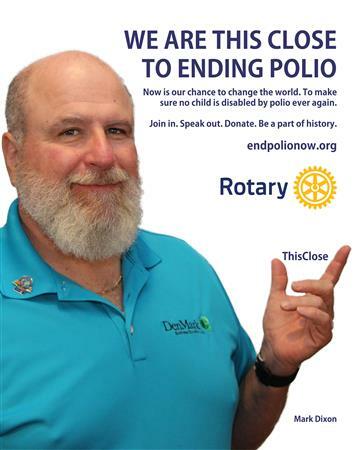 The Rotary Club of Mechanicsburg under the leadership of Dave Burns has started a fund raising project for Polio Plus in recognition of the 100th anniversary of the founding of The Rotary Foundation in 1917 at the International Convention in Atlanta. Michael (Mike) Romano was inducted as the club's newest member on December 21st. 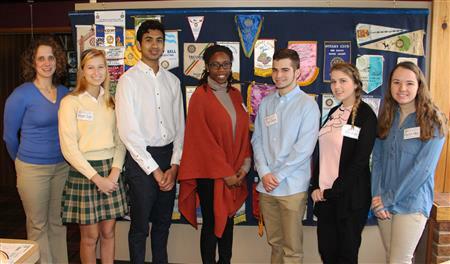 The annual Rotary District 7390 Rotary Foundation dinner was held at Central Penn College on November 30th and was attended by eight members of the club. 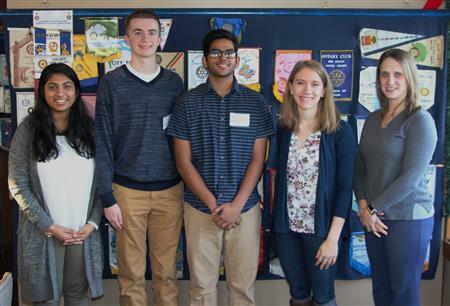 Students for the month of November were welcomed on Nov. 2nd and were interviewed by Amy Bockis, Student of the Month Committee member. 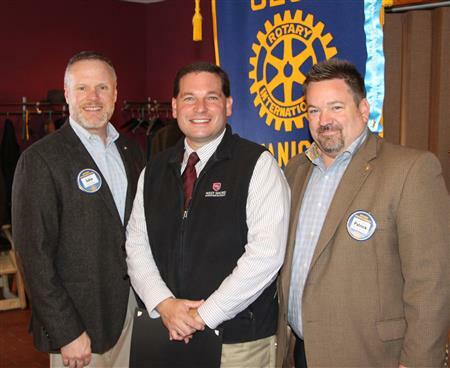 At the November 10th meeting, Rotary District 7390 Governor, Kevin Cogan, spoke to the club. 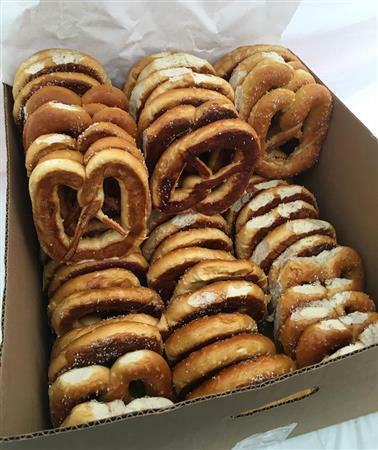 CEO Una Martone Introduces "Leadership Harrisburg Area"
At the October 12 meeting, Leadership Harrisburg Area President & CEO, Una Martone, spoke to the club about the organization. 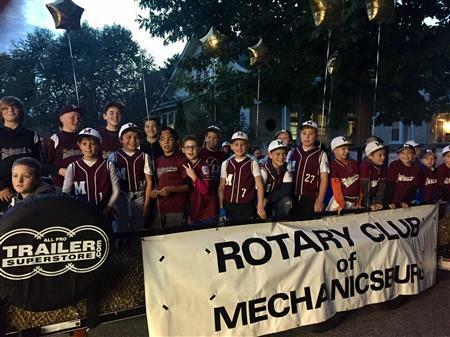 The Mechanicsburg Halloween Parade was held on Tuesday, October 11 starting at 7 PM. Students for the month of October were welcomed on Oct. 5th and were interviewed by Amy Bockis, Student of the Month Committee member. Neil Brownawell receives the Paul Harris Fellow award at the club meeting of August 31st. 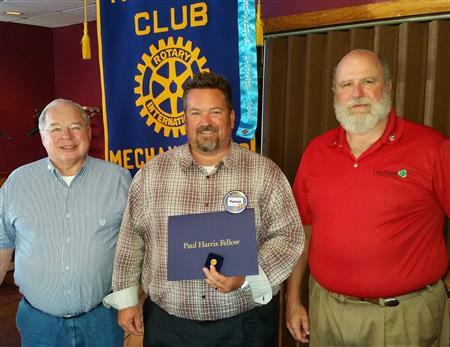 Past President Patrick Wolfkill was recognized by the club with a Paul Harris Fellow Award at its meeting on August 24th. 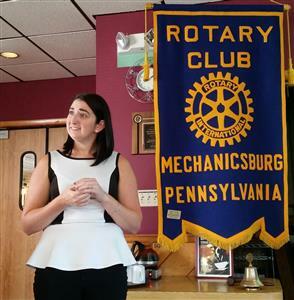 Mechanicsburg Police Chief Mindy Myers spoke to the club on July 27 and gave them an update on policing in the Borough of Mechanicsburg. 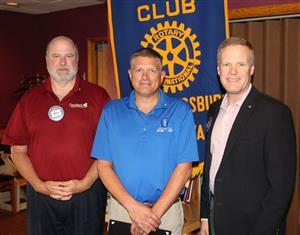 At the club meeting of July 20, Dr. Alan Vandrew, Assistant School Superintendent of the Mechanicsburg Area school District, updated the club about district. 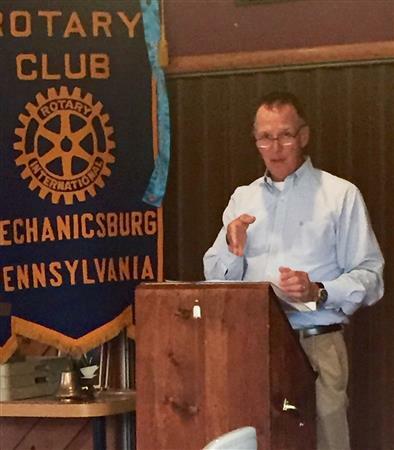 Mechanicsburg Councilman Gary Weber spoke to the club on July 13 and provided information about Mechanicsburg Borough happenings and items of interest. 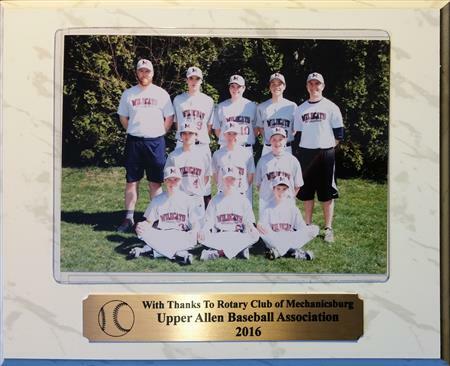 The Rotary Club's Mechanicsburg Little League Team's manager, Bryan Hellam, presented the club with a plaque in thanks for the club's sponsorship for sixty-four years. At a special evening meeting held at Duke's on June 29, the new president and board members were installed. 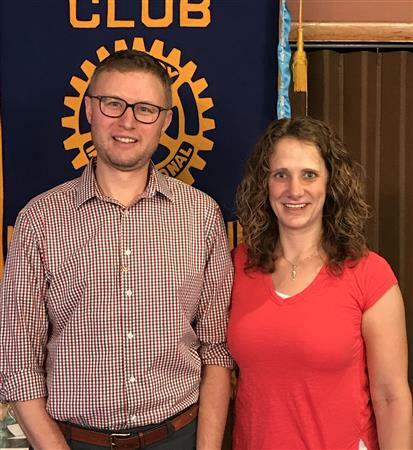 The program of June 22 included an update on two club grants - Youth Impact Project and 3D Printer for Northern High School. 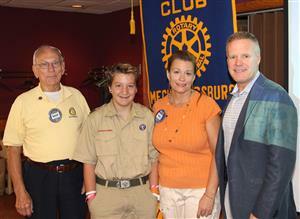 Jubilee Day on June 16 was a very successful day for the Rotary Club of Mechanicsburg. There was a great turnout despite the occasional rain and we sold out of pretzels at 7 PM. Thank you to all the members who helped. 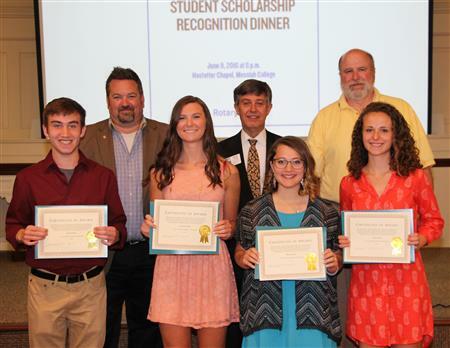 The Rotary Club of Mechanicsburg presented five $2,000 scholarships at a special dinner meeting held at Messiah College on June 8. The keynote speaker was District 7390 Governor Elect Kevin Cogan. At the club meeting of June 1, the club was recognized for sponsoring a team by presentation of a plaque shown in the thumbnail. Bob Hamilton receives his second Paul Harris Fellowship Award at the May 25th meeting. 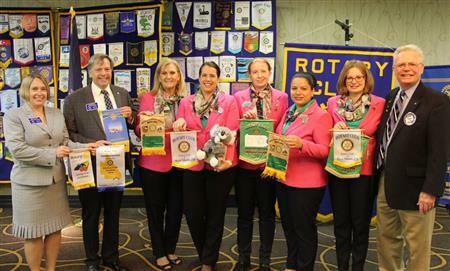 The Rotary Group Vocational Service Exchange Team (GVSE) from Australia Rotary District 9640 visited with our District 7390 Groups A & B the last week of April after their arrival in Harrisburg on April 23rd. The thumbnail image (click to enlarge) is the club banner exchange at the three club meeting on April 28. 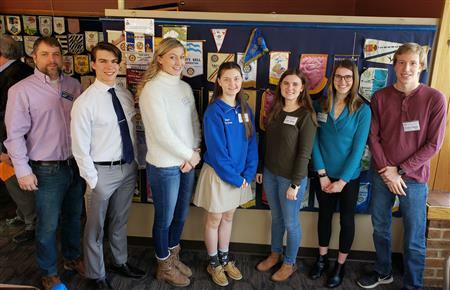 Left to right: Mechanicsburg North Club President Amy Spotts, West Shore Club President Joe McNally, GVSE Team Leader Rotarian Bron Lacy, Nadia Venzke, Renee Garske, Jo Bell, Caitlin Reid, and GVSE Group A Coordinator Tom Burson (Mechanicsburg Club). Students for the month of April were welcomed. Daniel R. Steinfield was inducted as the club's newest member on April 6th. 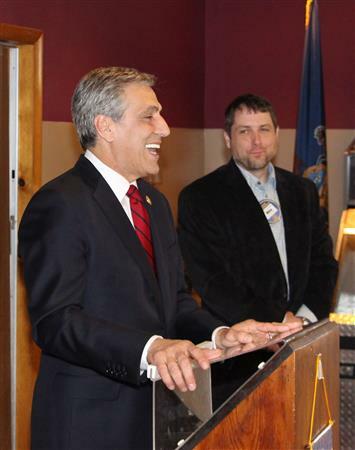 Congressman Lou Barletta of Pennsylvania's 11th Congressional District spoke to the club on April 6th. Students for the month of March were welcomed. Dino DiFrencesco was inducted as the club's newest member on February 24th. Students for the month of February were welcomed on February 3rd with Amy Bockis interviews. 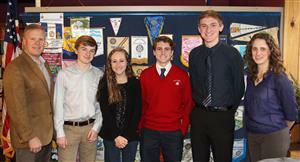 Students for the month of January were welcomed on January 6, 13, and 20 with Amy Bockis interviews. Students for the month of December were welcomed on December 2 with an Amy Bockis interview. 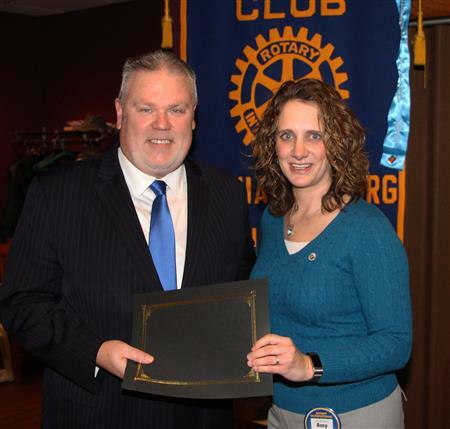 The Rotary Club of Mechanicsburg was honored with two awards at the Rotary Foundation Dinner held on November 19th. Our partner club in El Salvador, San Salvador Noroeste, reports that the construction of the water tank is progressing very well and they have shared some pictures. 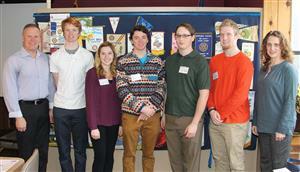 Students for the month of November were welcomed on November 4. 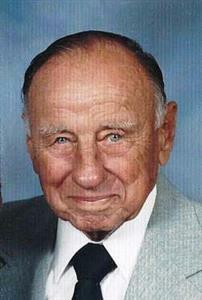 Longtime member Earl W. Pyke died on October 19th. He joined the Rotary Club of Mechanicsburg in August of 1953 and has faithfully served until the last few months. He has been active in various positions in the club and served as President in 1971-72. We send condolences to his wife, Jayne, and his family. He will be greatly missed by all. His obituary can be found at the Malpezzie Funeral Home web site. The Mechanicsburg Halloween Parade was held on Tuesday, October 13 starting at 7 PM. 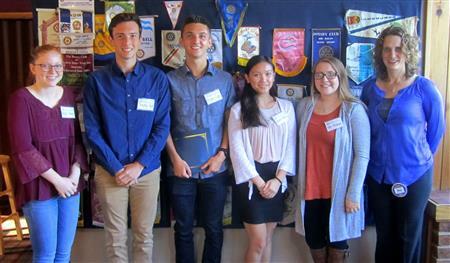 Students for the month of October were welcomed on October 7. 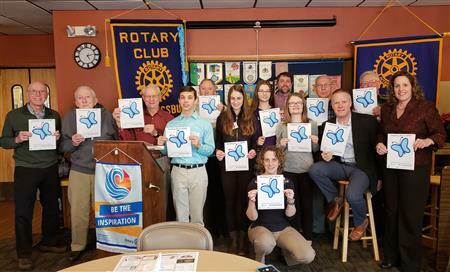 The Rotary Club of Mechanicsburg Ox Roast is a club sponsored fundraiser featuring either a roast beef or chicken dinner that includes meat, baked potato, pepper slaw, apple sauce, roll & butter and drink. Tickets are $11 in advance and $12 at the park and are available from any member. On September 2nd, the club inducted new member, Kelly Forbes. Marc Teenie was inducted as the club's newest member on August 26th. The El Salvador composting toilet project was completed as of May 25th but there is over $20,000 remaining which will be used to build a water tank. Sarah Thomas spoke to the club on July 22 about her experience with the GSE team to the Czech and Slovak Republics. 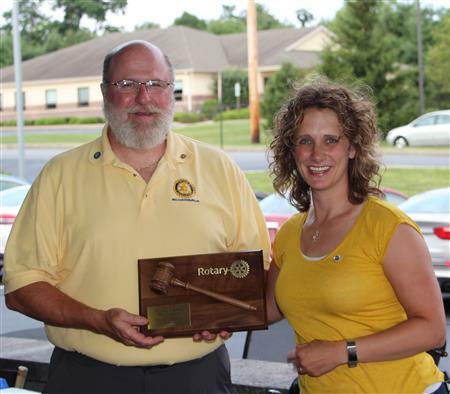 Rotary Club of Mechanicsburg Officers for 2015-16 were installed at the July 1st meeting. 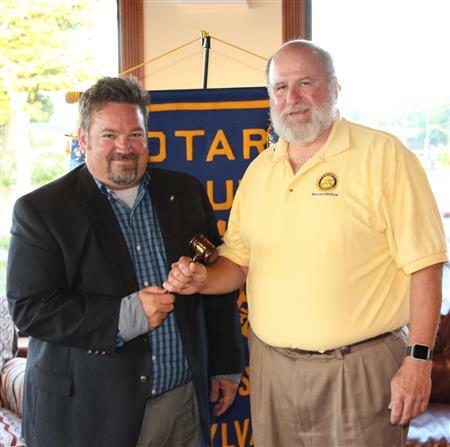 Patrick Wolfkill was installed as Club President for 2015-16 at a special evening meeting held on June 24. 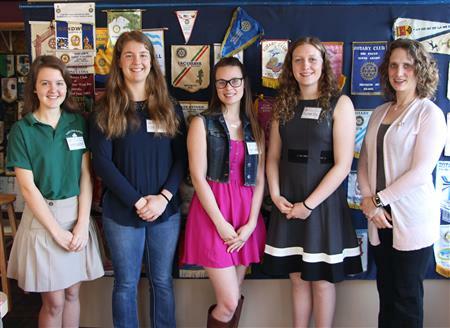 The Mechanicsburg Club was treated to an informative program on June 17 about the Youth Impact Project to be held at the Northern York High School on August 1, 2015. 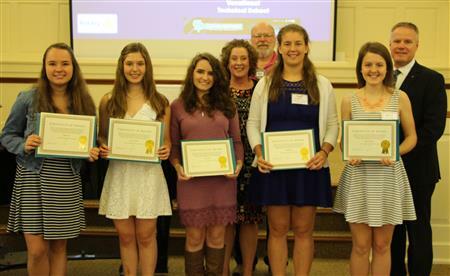 The Mechanicsburg Club awards five student scholarships at a special evening meeting on June 2 which was held at the Hoestetter Chapel at Messiah College. 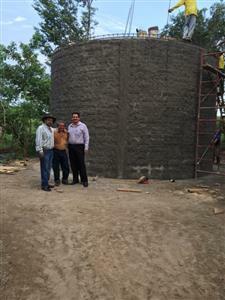 The El Salvador composting toilet project has been completed as of May 25th as far as construction and training. A detailed report with Google English translation is available here. The Group Study Exchange (GSE) team from the Czech and Slovac Republics Toured areas of interest in Mechanicsburg on May 13. Shown is visit with Chief Davis Spotts. See the team's FaceBook page here which describes their experiences day by day. The El Salvador composting toilet project is making very fast progress through the eleventh week of construction with the third stage (45 units) almost complete for a total of 135 units. A detailed report with Google English translation is available here. The Group Study Exchange (GSE) team from the Czech and Slovac Republics arrives. See the team's FaceBook page here which describes their experiences day by day. 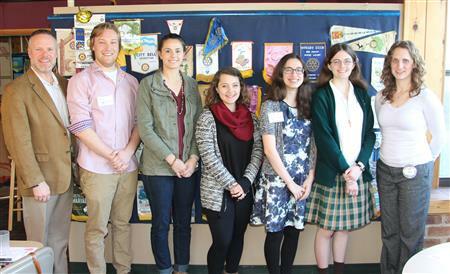 Students for the month of April were welcomed on April 1. The El Salvador composting toilet project is making good progress through the sixth week of construction withe the first stage completed (45 units) and much work done on the second stage. A detailed report with Google English translation is available here. 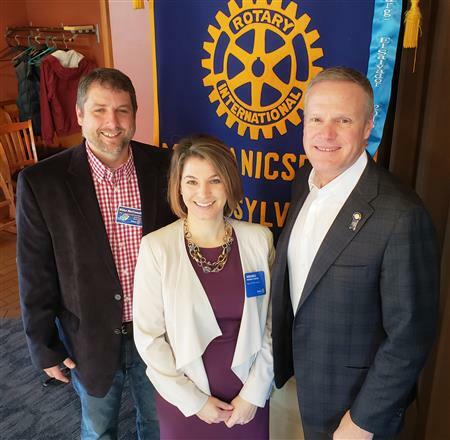 The Mechanicsburg Rotary Club celebrated the 77th year since its charter with a social event on March 18th at the Oaks Museum of Natural History at Messiah College. 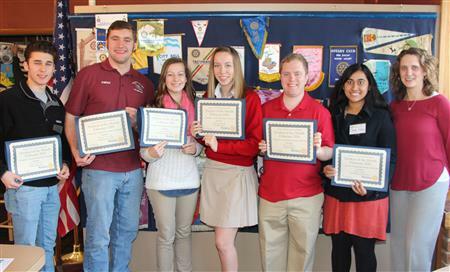 Students for the month of March were welcomed on March 11. The club has received a report on the results of helping to sponsor a very successful Joni and Friends family retreat event in El Salvador from Nov. 27 to 30, 2014. Students for the month of February were welcomed at the first meeting of the month. Students for the month of January were welcomed at the first meeting of the month. 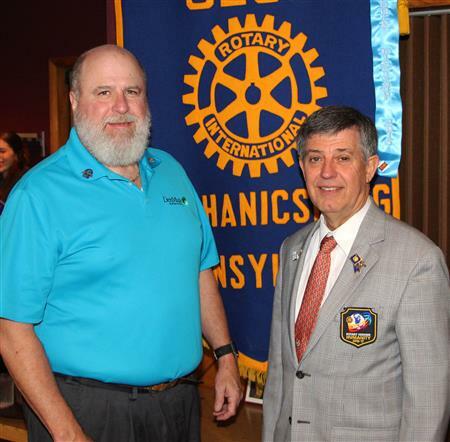 The Rotary Club of Mechanicsburg is happy to report that the construction of the 180 composting toilets in the community of Metalillito, El Salvador is about to begin. On Jan. 28, the club inducted new member, Joe Anderson. On January 7th John Petrie was awarded an additional Paul Harris Fellowship. 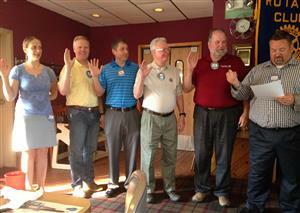 On Jan. 7, the club inducted two new members, Cal Williams and Danny Thompson. Students for the month of December were welcomed at the first meeting of the month. Students for the month of November were welcomed at the first meeting of the month. This is a revised story with all five students. 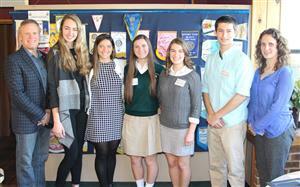 Students for the month of November were welcomed at the first meeting of the month. October 29, Brad McCarty, Head Men's Soccer coach from Messiah College speaks to club. 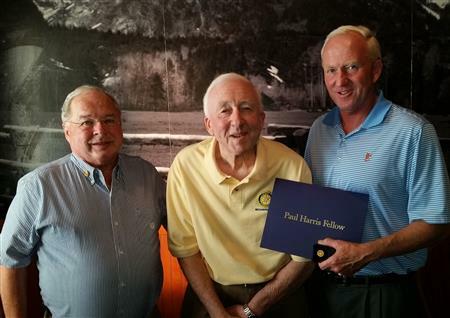 At the meeting of Oct. 29, John Cope honored two of his grandkids by making them Paul Harris Fellows. Paul Miller, a long-time friend and supporter of the club, celebrates his 95th birthday on Oct 26. On October 22, Danny Thompson spoke to clun about Cumberland Point Project. 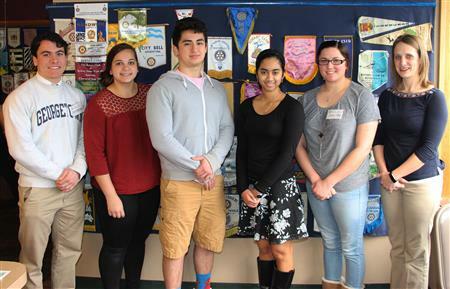 On October 22, Johnathan Hershey receives a scholarship from the Rotary Club of Mechanicsburg. 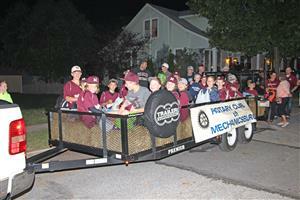 The Mechanicsburg Halloween Parade was held on Tuesday, October 14 starting at 7 PM. 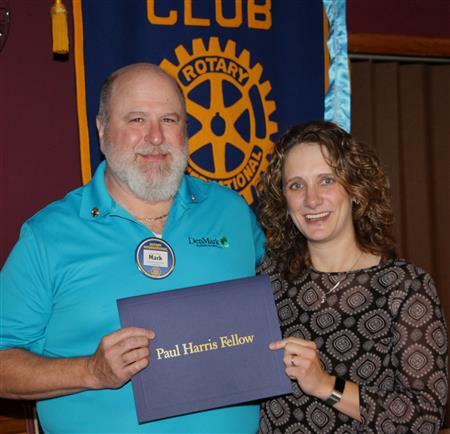 Lesile David Petrie receives the Paul Harris Fellow award at the club meeting of October 1st. Students for the month of October were welcomed at the first meeting of the month. 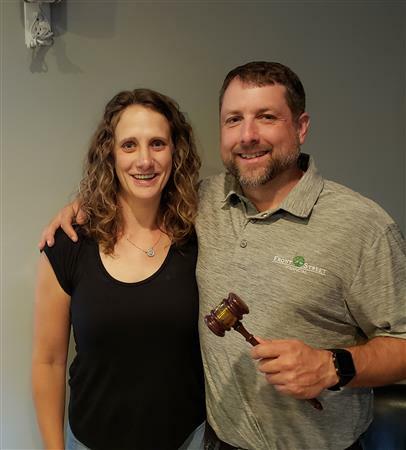 On September 17, Andrew P. Shay (Andy) of Uplifting Athletes was inducted into the club. 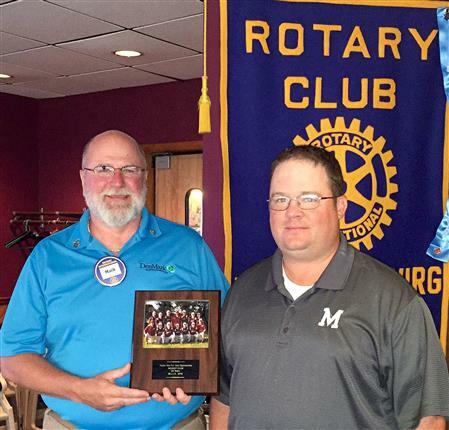 On September 3, Michael C. McConahy (Mike) of Wells Fargo Advisors was inducted to the club. Featuring complete dinners with tender roast beef or ½ char-roasted chicken $10 in advance or $11 at the park. 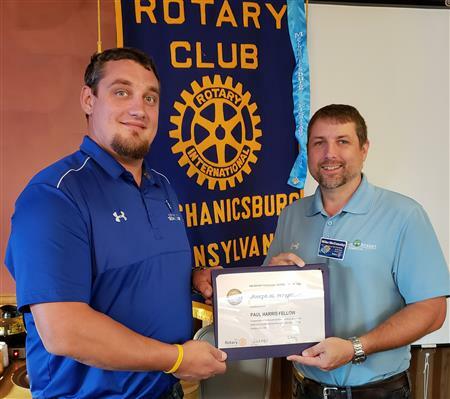 On July 30, Joseph M. Wright, Jr. (Joe) of Central PA Technologies, LLC was inducted to the club. 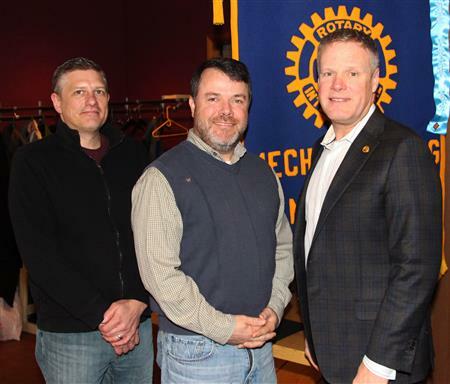 The Rotary Club of Mechanicsburg has completed its Global Grant request in conjunction with the Rotary Club San Salvador Noroeste in El Salvador to build 180 composting toilets in the community of Metalillito. It is currently awaiting (as of July 30) completion of a technical review by Rotary International. 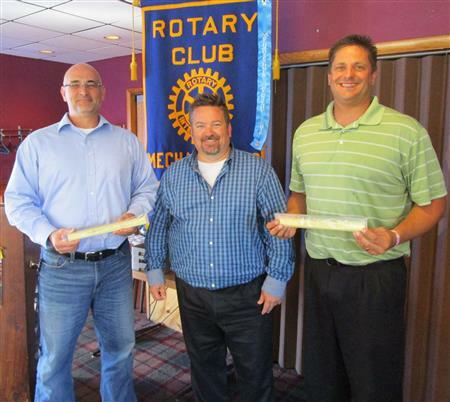 On June 25, Jeff Walker of Brown, Schultz, Sheridan & Fritz was inducted to the club. 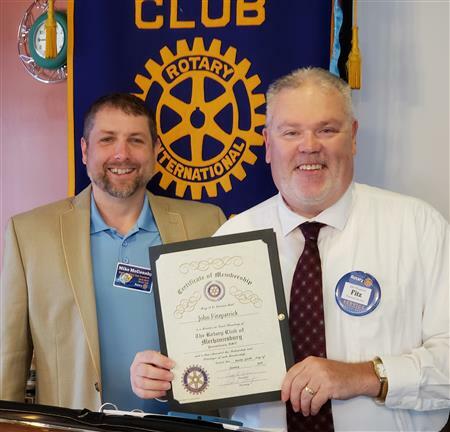 On June 18, Mark Dixon of DenMark Business Solutions, Inc. was inducted into the club. 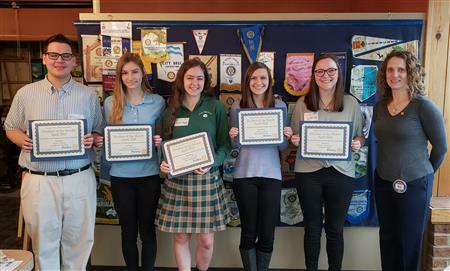 On May 28, the Rotary Club of Mechanicsburg awarded four scholarship to applicantants chosen from the student of the month during the school year 2013-14. 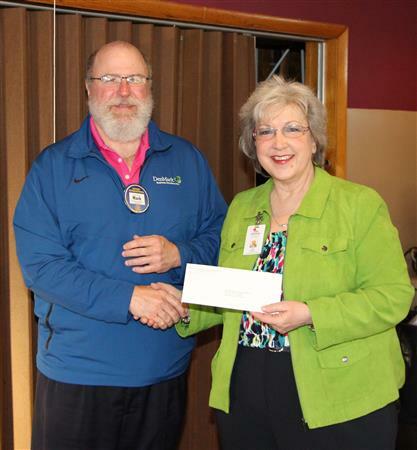 The Rotary Club recently applied for and received a District 7390 matching grant to improve the athletic facilities and equipment in the housing area of Cumberland Pointe. The club partnered with A.R.O.M.A Missions of Messiah College in identifying the need and accomplishing this project. 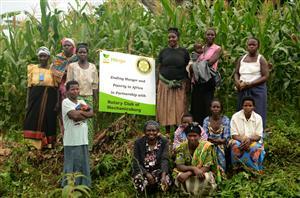 On November 13, 2013, Andy Agaba, the Founder & President of Hiinga updated the club on the progress of the project.